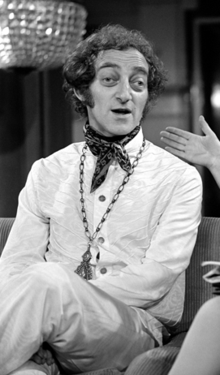 Marty Feldman (8 July 1934 – 2 December 1982) was an English writer, comedian and BAFTA award winning actor, notable for his bulging eyes. I was about five and a half or six when I converted [to vegetarianism] … I was brought up the first five years of my life in London, in the working-class part of the city, where the only animals that a child is liable to see are domestic animals, or cats, or pigeons, or horses, none of which one eats. Then I was evacuated onto a farm when the war came, and billeted with this family of farmers, and I got very friendly with a rabbit—George, the rabbit. Then one day, George the rabbit was George the lunch. For a farming family there was nothing obscene about that. They kill animals; they serve them up at table and say, "Hey, yes, that's the animal you were playing with yesterday! "—which is not abnormal. It was obscene to me as a child. I feel about Keaton the way an organist thinks of Bach.